Our unique selection of class ring style necklaces offer the perfect alternative to the traditional class ring. Featuring a design similar to the classic class ring, these gorgeous pendants carry the same special graduation message and are great to give to a special daughter, niece, granddaughter or friend. 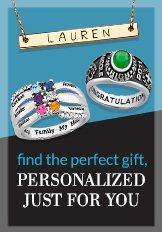 Choose from a variety of stone collars and engrave a special name or message.